Definitive Spanish stamps of 1875 to 1882 reflect the restoration of the monarchy and the ascension of the son of former Queen Isabella II as the new king of Spain. 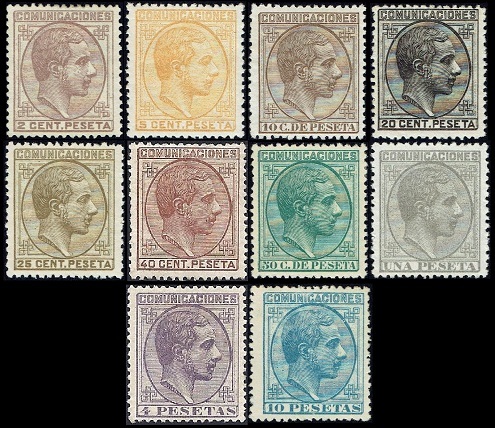 The ten portrait definitive Spanish stamps shown above were issued on August 1, 1875. These stamps are typographed on unwatermarked paper, and they are perforated 14. Each of the stamps has a blue-framed control number (1-100) printed on the back side, corresponding with the stamp's location in the plate. Thus, for the philatelist with a lot of available time, this can make plate reconstruction really easy! These new designs feature the right-facing portrait of King Alfonso XII. The stamps are all inscribed "COMUNICACIONES" meaning "(for) COMMUNICATIONS or LETTERS". 02 C. (1875 - Sc. #212) - Orange Brown, Chocolate Brown. 05 C. (1875 - Sc. #213) - Lilac. 10 C. (1875 - Sc. #214) - Blue. 20 C. (1875 - Sc. #215) - Brown Orange. 25 C. (1875 - Sc. #216) - Rose. 40 C. (1875 - Sc. #217) - Deep Brown. 50 C. (1875 - Sc. #218) - Gray Lilac. 01 P. (1875 - Sc. #219) - Black. 04 P. (1875 - Sc. #220) - Dark Green. 10 P. (1875 - Sc. #221) - Ultramarine. 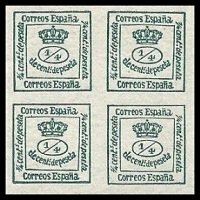 The block of 1/4 C. denomination Spanish stamps shown above (Sc. #221b) was issued on June 1, 1876. These were intended for use as newspaper stamps. There are several rather odd errors on block combinations of these stamps. Please see the major catalogs for details. 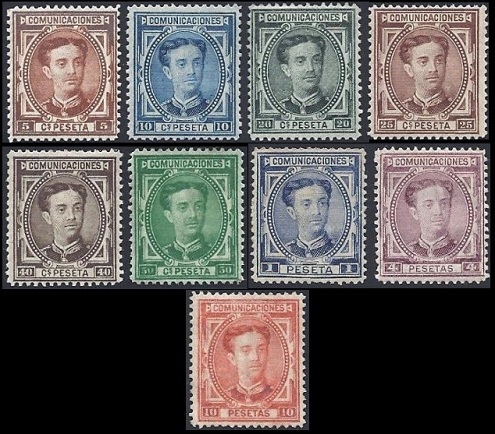 The nine major-type portrait definitive Spanish stamps shown above were issued on June 1, 1876. These stamps are engraved, watermarked castles, and they are perforated 14. These new designs feature the facing portrait of King Alfonso XII. 05 C. (1876 - Sc. #222) - Yellow Brown. 10 C. (1876 - Sc. #223) - Blue. 20 C. (1876 - Sc. #224) - Bronze Green. 25 C. (1876 - Sc. #225) - Brown. 40 C. (1876 - Sc. #226) - Black Brown. 50 C. (1876 - Sc. #227) - Green. 01 P. (1876 - Thin Numerals - Sc. #228) - Deep Blue. 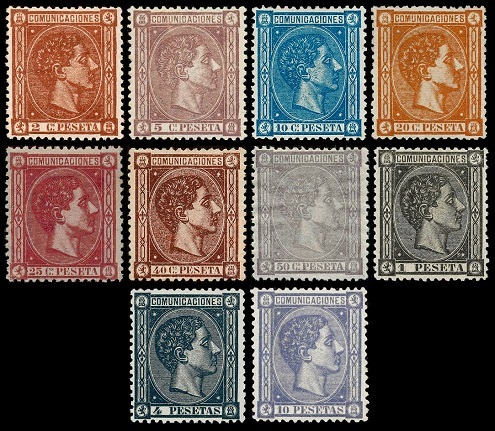 01 P. (1876 - Thick Numerals - Sc. #228a) - Ultramarine. 04 P. (1876 - Sc. #229) - Brown Violet. 10 P. (1876 - Sc. #230) - Vermilion. 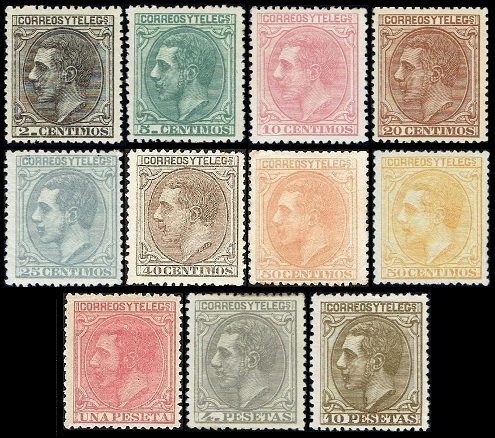 The ten portrait definitive Spanish stamps shown above were issued on July 1, 1878. These stamps are typographed, unwatermarked, and they are perforated 14. These new designs feature the right-facing portrait of King Alfonso XII. 02 C. (1878 - Sc. #232) - Mauve. 05 C. (1878 - Sc. #233) - Orange. 10 C. (1878 - Sc. #234) - Brown. 20 C. (1878 - Sc. #235) - Black. 25 C. (1878 - Sc. #236) - Olive Bister. 40 C. (1878 - Sc. #237) - Red Brown. 50 C. (1878 - Sc. #238) - Blue Green. 01 P. (1878 - Sc. #239) - Gray. 04 P. (1878 - Sc. #240) - Violet. 10 P. (1878 - Sc. #241) - Blue. The eleven portrait definitive Spanish stamps shown above were issued on May 1, 1879. These stamps are typographed, unwatermarked, and they are perforated 14. These new designs feature the left-facing portrait of King Alfonso XII. These stamps are all inscribed "CORREOS Y TELEG[RAFO]S" meaning "MAIL AND TELEGRAMS". 02 C. (1879 - Sc. #242) - Black. 05 C. (1879 - Sc. #243) - Gray Green. 10 C. (1879 - Sc. #244) - Rose. 20 C. (1879 - Sc. #245) - Red Brown. 25 C. (1879 - Sc. #246) - Bluish Gray. 40 C. (1879 - Sc. #247) - Brown. 50 C. (1879 - Sc. #248) - Dull Buff. 50 C. (1879 - Sc. #248a) - Yellow. 01 P. (1879 - Sc. #249) - Bright Rose. 04 P. (1879 - Sc. #250) - Lilac Gray. 10 P. (1879 - Sc. #251) - Olive Bister. The three new portrait definitive Spanish stamps shown above were issued on January 1, 1882. These new designs also feature the left-facing portrait of King Alfonso XII. 15 C. (1882 - Sc. #252) - Salmon, Reddish Orange. 30 C. (1882 - Sc. #253) - Red Lilac. 75 C. (1882 - Sc. #254) - Gray Lilac. 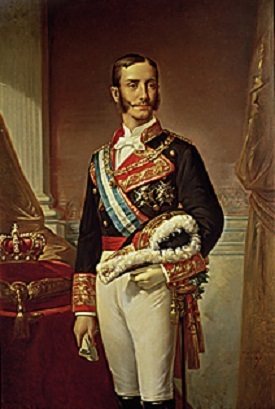 Alfonso Francisco de Asís Fernando Pío Juan María de la Concepción Gregorio Pelayo of the House of Bourbon (1857-1885) ascended to the throne of the restored Spanish monarchy, as King Alfonso XII, on December 29, 1874. Being of a benevolent and compassionate nature, he quickly won the affection of the Spanish people. During his short reign, peace was established both at home and abroad, and the nation's infrastructure was strengthened considerably. Suffering from Tuberculosis and Dysentery, the 27-year-old king died on November 25, 1885. His wife, Maria Christina of Austria, was still pregnant with their child. This unborn child was acclaimed as the new Spanish monarch. When the son of King Alfonso XII was born on May 17, 1886, the infant immediately ascended to the Spanish throne as King Alfonso XIII.